In our Denver chiropractic clinic, we often see cases of tailbone pain walking through our doors for treatment. Tailbone pain, or coccydynia, is an uncomfortable condition that many people seek out care for due to the intensity of pain and the disruption of basic activities such as sitting, standing, and walking. Treatment methods are customized in our clinic based on where and how the pain presents. Direct impacts – Falls, accidents, or direct blows to the tailbone region. Spontaneous – At times, there is no reason for the pain to present in the patient’s mind. This is typically called idiopathic coccydynia. Excessive sitting, altered biomechanics, or pelvic musculature are theories. 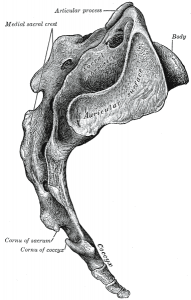 Fractures – Although much less common, fractures can present in the coccyx or pelvic unit. Is Chiropractic Treatment for the Tailbone Painful? Most patients find relief with the chiropractic treatment for tailbone pain in our clinic. With a variety of techniques to use based on the location of the pain and injury, we can customize treatment based on your comfort level. Our chiropractor will always recommend at home care to prevent further injury and to increase recovery time of the current episode. Dr. Todd Williams, D.C., will always go over the recommended treatment plan following an examination of the injured area so that you are always aware of what treatment will be like. If your are currently experiencing tailbone pain, it is important to rule out other causes and accelerate healing of the area to reduce reinjury in the future. Core Family Chiropractic will perform a complete comprehensive exam to find the underlying cause of the pain and apply customized treatment for relief and prevention in the future. We are located in Edgewater, CO directly in between Denver, Lakewood, Wheat Ridge, and Arvada and accept most major insurances. If you have any further questions regarding treatment or your condition, or would like to schedule an appointment: Please Call 720-242-6251 or schedule online.